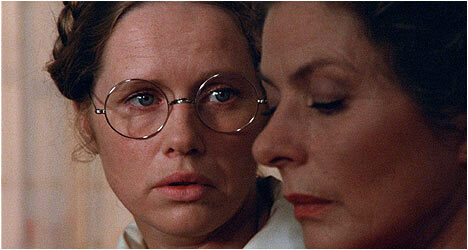 Autumn Sonata (1978) features a simple story – Eva (Ullman) invites her mother Charlotte (Bergman) for a visit – but the emotional baggage that exists between these two characters is quite complex. It’s been seven years since the matriarch’s last visit and in that time Eva married Viktor (Bjork), a minister, had a son with him, who died when he was four-years-old, and is currently taking care of her physically handicapped sister Helena (Nyman). Viktor addresses the camera, introducing his wife and providing a brief backstory and insights about her. We find out that Eva had led quite a life so far, but something is missing from it and that has to do with the strained relationship with her mother. Charlotte arrives and they seem to get along swimmingly as they go through all the usual idle chit-chat, including her recounting her husband dying – a lengthy monologue that veteran actress Ingrid Bergman delivers like a pro. Eva and Charlotte obviously love each other as evident from how they interact early on, but pretty soon old grievances rare their ugly head, culminating in a brutal all-night confrontation between the two women. The major axe Eva has to grind against Charlotte is how she put her career as a concert pianist ahead of her family time and time again, whether it was having an affair while on tour or not being their for her grandchild’s birth (or there after he died). Eva has carried these emotional wounds around with her for years and this visit is her opportunity to confront Charlotte. Not surprisingly, Autumn Sonata features blistering performances from Bergman and Liv Ullmann who dig deep and deliver some powerful scenes together as Eva and Charlotte engage in rather heated verbal sparring. Ingmar Bergman has created an intense, character-driven drama that is, at times, painful to watch because of the raw emotions it examines with unflinching honesty. The first disc starts off with an “Introduction by Ingmar Bergman,” which is an excerpt from a 2003 interview with the director where he talks about the origins of Autumn Sonata, including meeting Ingrid Bergman for the first time. Also included is an audio commentary by film critic Peter Cowie. He starts off recounting the backstory to the film and putting it into context with Bergman’s career, which, at the time, saw him in self-imposed exile. Cowie does a nice job recounting filming anecdotes and examining its themes on this informative commentary. Veteran actress Liv Ullmann talks about her numerous collaborations with Ingmar Bergman, specifically Autumn Sonata. She offers observations on his working methods and provides fascinating insight into the making of the film. “Ingrid Bergman at the NFT” is an interview conducted in 1981 where the actress talks about her career, specifically her stint in Hollywood and working with auteurs like Roberto Rossellini, Jean Renoir, and, of course, Ingmar Bergman. On the second disc is a must-see for fans of this film – a making of documentary that runs more than twice as long as the film itself. It was shot on the set and goes into great detail on how Autumn Sonata came together through revealing rehearsal footage with the actors. This film provides marvelous insights into how Ingmar Bergman worked and, most importantly, with actors, including the friction between him and Ingrid Bergman who came from a completely different way of making films. In some respects, the documentary is as unflinchingly honest as the film itself.